Have you found an online vendor selling Don Q Gran Anejo? Poured neat, you smell a lot of oak and spice with a hint of honey. It rolls over the tongue nicely with a lot of flavor. Bourbon drinkers will like the oakiness. It leaves behind a bit of anise that would pair nicely with a cigar. Notice the title of this review doesn't say this is just the best rum, but rather the best rum for anyone who truly enjoys fine spirits. This is because Don Q Gran Anejo is NOT ridden with tremendous amounts of sugar and additives added after distillation. This seems to be what most rum heads regard as 'smoothness' and 'complexity'. Why don't you guys buy some cheap 151, raw molasses, vermouth, spices and make your own pre-batched cocktail because that's what you're really drinking (and this includes Zacapa, Zaya and even Diplomatico). The DQ GA drinks likes a dream and shows what a real unadulterated and extremely fine aged rum should taste like. I love the nuttiness from the sherry barrels and the full dark caramel mouth feel that resembles a fine cognac. If you want a one of kind cocktail make an Old Fashioned or Manhattan out of it and enjoy the fact it's not too sweet to do so right out of the bottle. BTW, to Luis the reviewer below, I really have no idea what you're talking about comparing this or anything of Don Q's disfavorably to Bacardi. Luckily, you're a very small minority. The only thing Bacardi has done for the industry is make people stop drinking rum after they're out of high school. Oh I guess, those poor Cubans (fyi, they really left Cuba to keep exporting to the U.S. when Fidel took power) can also be credited with pumping a whole lot of waste water into the Caribbean and confusing consumers about what really is Puerto Rican rum. And, nothing of Bacardi's even the 'Facundo' B.S. comes even close to this Gran Anejo. I hope you got paid for your ignorant review or will someday. Otherwise, I really have no idea what's wrong with you. Having this New Years Day 2015. Reminds me of Zacapa 23 but a little smoother. A fabulous premium rum if you have the scratch. It comes in a wonderful box that looks like a silk coffin. I love sipping it on special ocassions. 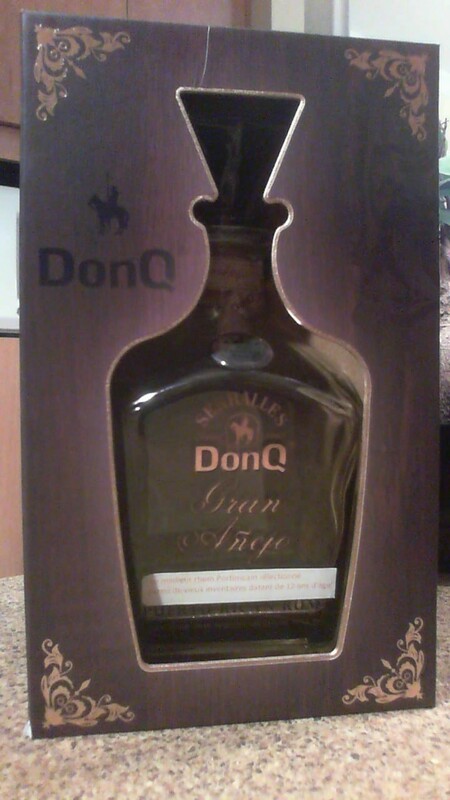 The best I've had from Don Q. Nice presentation but not up to the hype it gets. I tried it, not bad, could be better. When I compare this to other rums in my bar, I take the other rums. I like this rum. It needs an ice cube or two to go down smoothly. Not sure is buy it again until I try a few more "high"ish end rums. It has some bite, but you get that when you sniff the cork as well. But it sips nicely next to a fire on a chilly night, so crack open a bottle and enjoy it with friends. This is one of the few rums I've rated at 8 or below that I like better than the consensus score (currently 7.3 as of this review). In fact, I like this more than many $100+ rums I've reviewed. Molasses, oak, honey, vanilla, bourbon, leather, tobacco, and cinnamon. A very nice smell, and a good taste. Only $45.99 at Bevmo! (2015 price), this is a good value. I recommend it! This is one of the few rums that I can drink on the rocks. It is amazing how smooth - but tasteful - this rum is. I have it over Bacardi's "Reserva Selecta." This expression of Don Q is superb. Smooth, light with subtle vainilla, caramel and oak. You could understand and appreciate what aging do to rums when comparing it from the Añejo. For me, it's a benchmark. There is a slight burn on the nose but you can smell some of the woodiness. You can taste the cask and some subtle sweetness. Very smooth finish with no burn. Compared to some of the other nice aged rums (Santa Teresa 1796 and Brugal 1888 to name a couple) this is a definite contender to keep on my shelves. This expression of Don Q is superb. Smooth, light with subtle vanilla, caramel and oak. A true Puerto Rican rum. This is what happens when a rum is aged properly and bottled without adding any additives. Old school great Rum. this rum is fine. it's just a little too much sweetness, a little too much harshness, a little short on spice and character, a little short on barrel. its tasty, but not great. if it were a $35 bottle... yessir. for $~60? there are a lot better choices. Bought a bottle of Don Q Gran Anejo earlier this year when vacationing in Puerto Rico. Bottle sits in a very nice cradle and the bottle itself is very presentable. Unfortunately the contents are very disappointing. Strong smell, even stronger burn and no quality on this rum at all. Tried this along side other Don Q offerings. Found that their standard Añejo and the 2005 Single Barrel had a much better flavor. A bit on the pricey side for what you get. It's a good rum, but that's the problem. A Grand Anejo should offer something a little more. Another one that I tried at Don Q's tasting room and store in San Juan. I liked this one better. Fantastic aroma and nice smooth flavor; very bourbon like to me which is not a bad thing! I would recommend it for sipping neat, on the rocks, or in top shelf mixed drinks. Ce rhum est très bon, il un gout de caramel, de miel et vanille et quand même complexe. Le prix, la boite et la bouteille ne représente pas le rhum dedans. Il ne faut pas se fier a l'emballage. Very clean aged rum, without lots of extra sugar. Hints of molasses, bourbon, and cinnamon heat make this a great rum to experience neat. I purchased a bottle of this rum at a military PX on Puerto Rico for about $35, a much friendlier cost compared to the $70 it costs in the States. The bouquet is pleasant thought I found the flavor profile did not match up as it was not particularly great. Good, but not great. i rate this as not in my top 5. the bottle looks good on the shelf, but it is just no better than 7. my opinion. I like a rum that I can sip... this one is moody... Half the time I think it's good, the other half I can't help it but to dump coke on it. I'd rather have two bottles of diplomatico for the price of one of these! This isn't a bad rum but it's far from great. The bottle may be it's most distinctive feature. Notice there isn't a single review focusing on taste and aroma? That's because this disappointing rum has no distinctive flavor. I can't identify a characteristic. It's reasonably smooth but yet has an after burn that you'll notice at first. This isn't bad. It's just not great. I can think of 10 rums I'd rather drink but at least 10 that are far worse.